Wasps use a wide variety of nest protection strategies, including digging holes or occupying pre-existing cavities such as in wood. Previous studies showed that the nests of cavity-nesting wasps contain several brood cells separated by thin walls of plant debris, resin, or soil. Once the females have finished constructing the nest, laying eggs, and providing food, they construct an outermost vestibular cell to close the nest. After construction, female wasps abandon the brood and do not care for their offspring anymore. 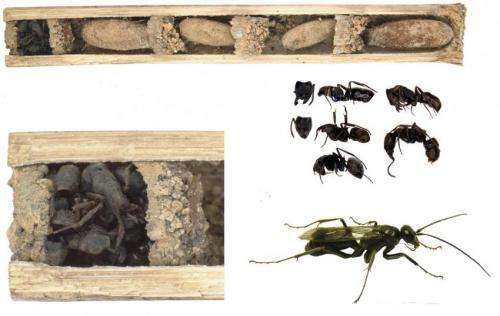 Nest protection strategies play a central role in brood survival, and in this study, scientists interested in better understanding these strategies collected ~800 nests of cavity-nesting wasps with ~1900 brood cells belonging to 18 species in South-East China. The scientists found a nesting behavior previously unknown in the entire animal kingdom: in over 70 nests they found an outer vestibular cell filled with dead ants. The species constructing these ant-filled vestibular cell was so far unknown to science and was described in the same study as the 'Bone-house Wasp' (Deuteragenia ossarium), after graveyard bone-houses or ossuaries. The scientists also found lower parasitism rates in "Bone-house" nests than in nests of similar cavity-nesting wasps. The authors suggest that D. ossarium nests are less vulnerable to natural enemies, potentially supporting the outer cell's role in defense, which most likely involves chemical cues emanating from the dead ants used as nest-building material.